Announcing new release of MindForger that brings integration with MindRaider. MindRaider is a desktop outliner that enables off-line and sharing of your outlines. 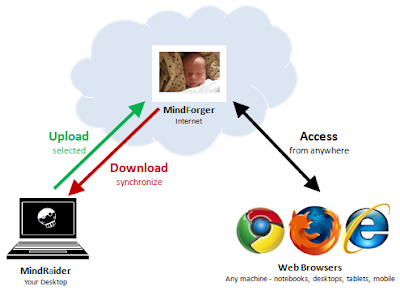 MindForger is an online companion of MindRaider. With MindForger you can upload your outlines on the web and easily access them from any device. Check MindForger - your Outlines on the Web for more details. The documentation says MindRaider can be used as a RDF viewer/editor. How does one load an existing RDF file into MR? How does one export to RDF? ... but apparently I didn't updated documentation. I apologize for that and I will fix it in the next release. MR still has RDF in its hearth and both his runtime and persistence is based on it - check .mindraider and MindRaider/Notebooks directories in your home. If you want to to try the viewer/editor functionality, you may install older version, but as I mentioned above it never get mature.